*Price per pouch. See seller’s website for more information. Shipping is free to continental US. I’m not the only one who enjoys shooting, collecting, and owning firearms. While the actual firearms and ammunition typically pique my interest, the necessity of proper gear for specific roles cannot be ignored. If you do nothing more than go to a shooting range in your free time, or are one of the many exercising your ability to be an armed citizen, holsters for your handgun and magazines are as fundamental as the firearm and ammunition. Having a new-to-me Walther PPQ, I set out to find some holster and pouch options. Kydex is a popular material for holsters and having experience with it in the past, it presents itself as a rather ideal material. Consequently the number of manufacturers utilizing the material are a dime a dozen with quality ranging from poor, to eloquent functionality. 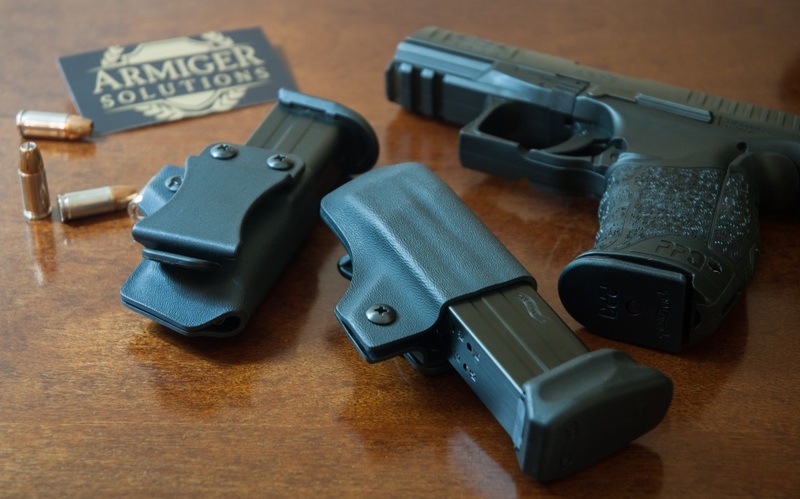 Armiger Solutions’ products are no slouch with their lower-profile designs contrary to the common “flat surfaces deserve eyelets” mentality of most kydex holster manufacturers. Need I mention RCS? You may note in the photographs here and on the manufacturer’s website, that manipulation of the kydex material is favored over repeated (ad nauseum) uses of eyelets. This minimalism is attractive while providing a more than competent level of structure, and a welcomed low-profile style. When carrying more than one single pouch, or other items on your belt, you have just a bit more flexibility in placement than the traditional eyelet-heavy design. The manufacturer offers the pouches in various kydex colors and patterns so if you care to rock a hot pink mag pouch, you’re more than able to.